As I’ve previously mentioned here, our favorite Aussie fashion brand has finally arrived in Manila! YAY!!! To celebrate this momentous occasion (how dramatic haha), I, along with Bench/Suyen Corp. a.k.a. 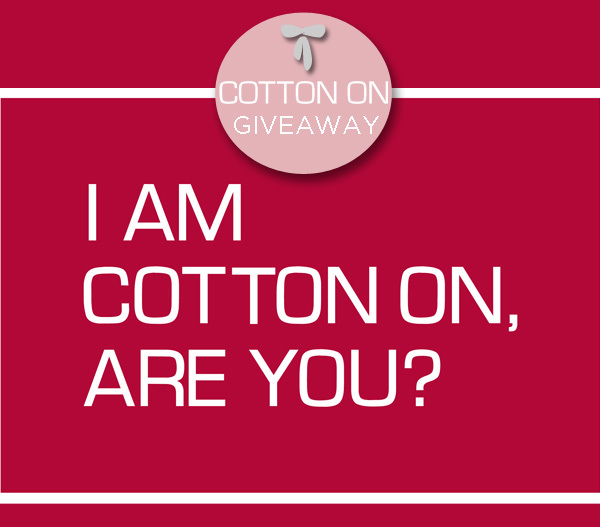 the great people responsible for bringing Cotton On in, have decided to throw a little giveaway for my readers. Note: readerSSSSSS. Just how many of you? Oh, only about a hundred. Yes!! That’s right! 100 of you will get to win 10% discount coupons valid for use during Cotton On’s opening this September 7 at SM Mall Of Asia! Ten percent is a lot, mind you, especially when you can consider how affordable Cotton On’s items already are. So, are you ready to join? Before you start typing away in my comment box below, follow these steps CAREFULLY! The first 100 to fulfill all these steps win! This contest is open for local residents only. Deadline for entries is on September 6, 11 PM. No multiple entries please. All comments will be published here only after I review them so once you’ve submitted your entry, don’t be surprised if you don’t see it published right away. (Mysterious kung mysterious!) I will announce the names of the 100 winners here in the comment box below on September 6, not later than 11:59PM. Winners should claim their discount coupons on September 7, 9 AM onwards at the registration table set up at Cotton On, SM Mall of Asia. Please bring a valid ID to claim your coupons. All coupons must be used on September 7 as well. 1. Roger E. Tadefa Jr.
btw, I used my sister’s twitter account ’cause I was having trouble with mine. Is that ok? Ugh! Typo! It’s Margarita. Sorry! Hi! Question. Can I use 2 or 3 discount coupons for 1 transaction or 1 coupon per transaction only? Also, can I pick up the coupons in the evening cause I’ll be going after work pa. Yes you can pick it up anytime during the day. :) I think you can use the 10% coupon on all your purchases but only 1 coupon. Oh I see. I got 3 coupons kasi, was wondering if I can combine the 3 coupons for 1 transaction. Haha. Thanks!!! Sorry, but your account is protected so I can’t view the photo. Sorry about that. I’ve changed the settings na. Hope you can view it. Thanks! my photos are on twitter :) thank you! Sorry, the page can not be displayed. This may be because you are account is set to private. Photos to prove that you followed the steps please. Can’t view the photo because your twitter account is set to private. If your account is on private, I can’t view the photo. Please send tweet link as well. 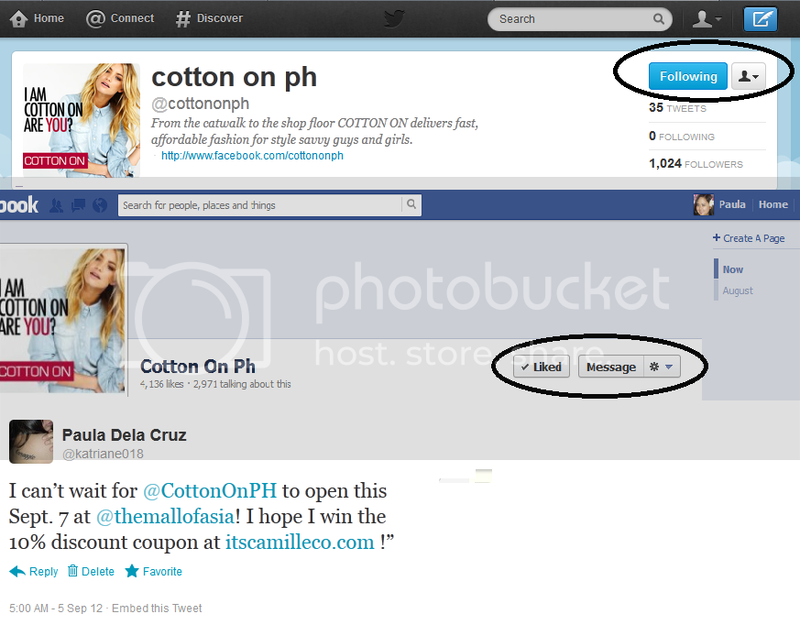 The link of the photo that proves I liked CottonOnPH on Facebook. Your account is private so I can’t view all the photos. Your FB account is private so the page can’t be displayed. 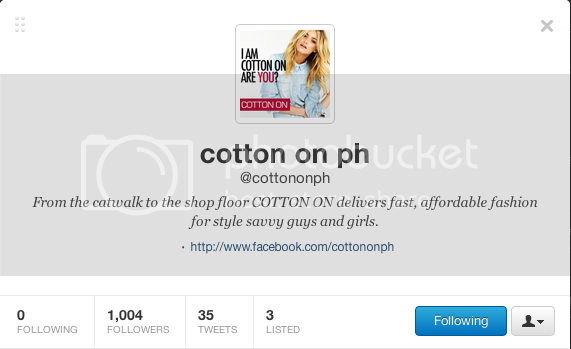 Super excited for Cotton On’s launch! Hi Candy! Your FB account is private so the page can’t be displayed. Here’s my album on facebook where proof of doing all the mechanics uploaded (screenshot).